It’s both a tagline and marching orders for Gannett Company. Announcing the death of print media isn’t interesting anymore, but the way newspaper companies try and convince us that they are still doing well is. Most are trying to innovate, rebrand or refocus, but Gannett’s plan is much simpler. The plan: acquire companies to scale quickly, cut costs and bring on the digital talents needed to make it all work in today’s media market. It’s not a particularly exciting plan, but the company may not need exciting to make it work. Earlier this year, a deal to acquire Journal Media Group for $280 million was completed, which expanded the company’s number of daily print papers to 107 in the US market. Gannett is now the largest media network hitting both local and national audiences, according to the company, giving it the benefit of scale. Gannett also tried acquiring Tribune Publishing earlier this year, but that plan failed. After splitting from Tegna in 2015, Gannett’s CEO discussed his plans to cut expenses across the brand by $67 million in the first half of 2016, accomplished in-part by centralizing parts of its many newsrooms, like copy editing and print design. The most recent step of the plan is the $156 million acquisition of ReachLocal, a digital advertising firm. The deal puts Gannett in a place to bring digital advertising in house, which is currently done through a partnership with its former parent Tegna, according to John Janedis, an analyst at Jefferies. It’s all part of the plan to make newspapers work when consumers are demanding digitally focused organisations. “While the core publishing business will remain a focus for investors, digital should become increasingly visible and ultimately shape the growth profile for the company,” Janedis said in a note to clients. 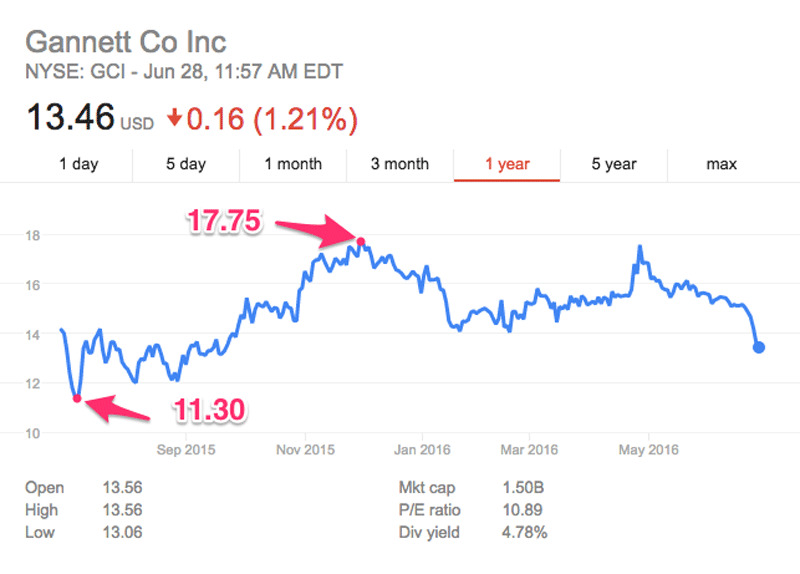 Janedis rates Gannett a hold, and has a price target about 25% higher than the company’s current share price of about $13.50. Shares have been up and down over the previous year, hitting a high of $17.75 on December 1, and a low of $11.30 on July 8, 2015. Gannet’s competitors in the newspaper industry have radically different approaches. Take Tronc. The guttural-noise-turned-company-name was announced as the new face of Tribune Publishing. Tron is trying to rebrand itself as a digital-first news company. It’s adding catch phrases like “pixels to pulitzers,” which haven’t landed well with the digitally savvy audience Tronc is trying to court. The Washington Post has adopted Jeff Bezos as its owner in order to fill the gap between falling revenues and higher costs. The paper is doing well, but for all the investigative stories and captivating video, the company still isn’t profitable, and is potentially looking to cut costs by 50%, according to New York Magazine. As Recode put it, “most newspapers don’t get to have a billionaire sugar daddy” like the Washington Post, and companies like Tronc can’t afford to play around in the same way. As of right now, Gannett has one of the highest reported earnings per share of newspaper companies, reporting $1.22, compared to the $0.41 of the New York Times and -$0.42 of Tronc. Gannet is one of the few companies that seems to be executing a plan for the future that could lead to profitability, even if that plan is still being tested.